The weight of the paper you choose for your printed marketing materials will have a dramatic affect on overall quality and finish. Paper weight is measured in grams per square metre or GSM as it is more commonly known. This allows you to understand the weight of paper. In general, the higher the GSM rating the heavier and thicker the paper will be. Not only will the weight of the paper impact on the quality of the finish it will also affect printing and delivery costs, the weight of the paper will determine the final weight of your printed materials and therefore delivery costs if you are planning a direct mail campaign. When choosing the weight and quality of your paper consider the first impression it will give to your customers, heavier paper will give the impression of higher quality. Lighter paper is more likely to tear easily or get damaged. It is also worth mentioning that bright colours and bold, heavy text have a tendency to be seen on two sides of a page, especially if the page is light, thin and poor quality. In this instance a heavier, thicker paper would be better suited. 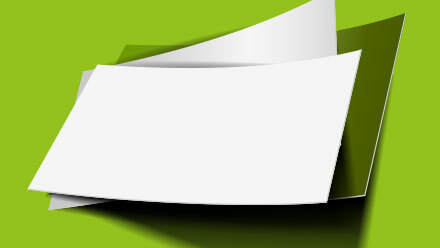 80 – 120gsm is the general weight of standard office paper. This weight of paper is best suited to letters, compliment slips and letterheads. 130 – 170gsm is a heavier, more durable paper that is generally used for posters, leaflets, flyers and pages inside brochures. 170 – 200gsm is the halfway point between paper and card. It is great for brochure covers and high quality posters and double sided leaflets. 200 – 250gsm is the paper weight point of heavier card and adds a quality finish to brochure covers. 300 – 400gsm falls into the board category and is usually a good weight for business cards, it can be used for brochure covers but there could be implications with stitching and folding. 400gsm and above is considered a thick and high quality weight for business cards. When making your final choices ask your printer to provide samples of each paper weight. This will enable you to get a good feel for the overall quality and finish of your printed materials.